Welcome to Carter Beach! Bubble your cares away by the seaside. Enjoy fabulous views while you dine alfresco. The deck continues right out on to the dock. There are several groupings of outdoor furnishings where you can talk and soak up the sun. The view is magnificent, whether dining indoors or out! Gorgeous new kitchen and dining area. The living room has comfortable couches to relax on. A cozy spot to curl up and read. View from the game table. The master bedroom showing the skylights and master bath vanity. Bedroom #2 offers a queen bed. Connecting bath with dual vanity. 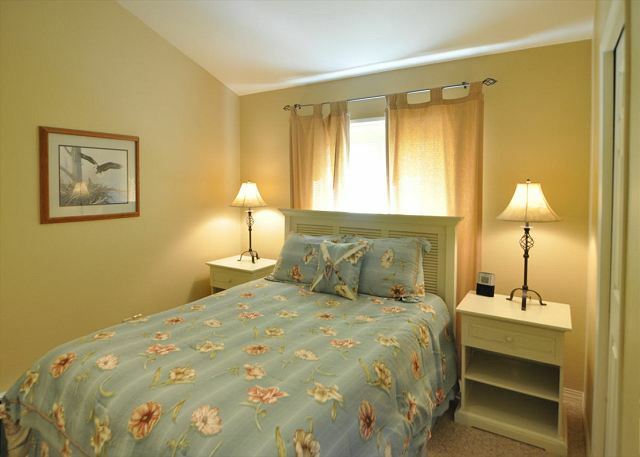 The third bedroom offers both a queen and twin bed. 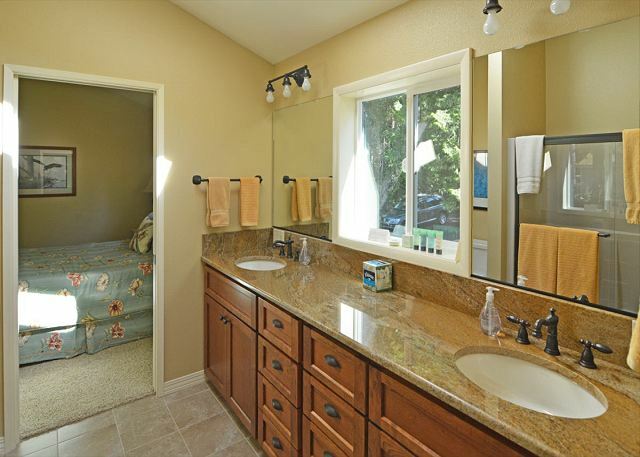 Recently updated jack & jill bath between bedrooms 2 and 3. Newly remodeled bath #3 on lower level. A convenient office nook is located off the kitchen. What a view! Mountains, islands, and the boating traffic. 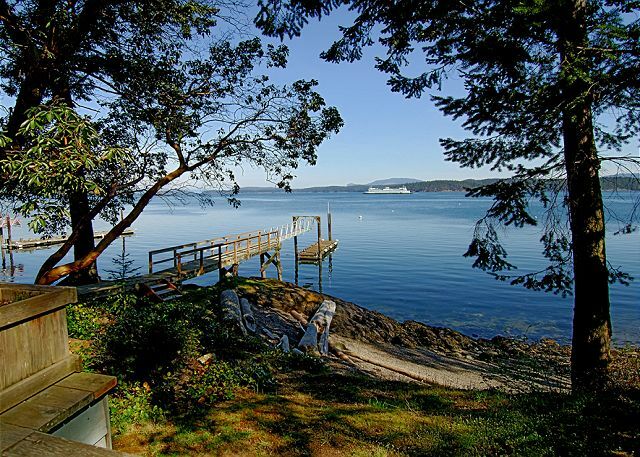 Completely remodeled in 2013, this great waterfront home, near Friday Harbor, has it all! 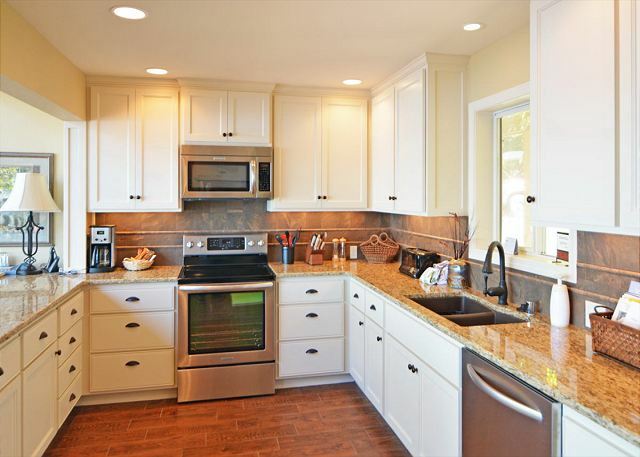 *A beautifully remodeled kitchen with granite counters, new stainless steel appliances, & updated flooring and lights. 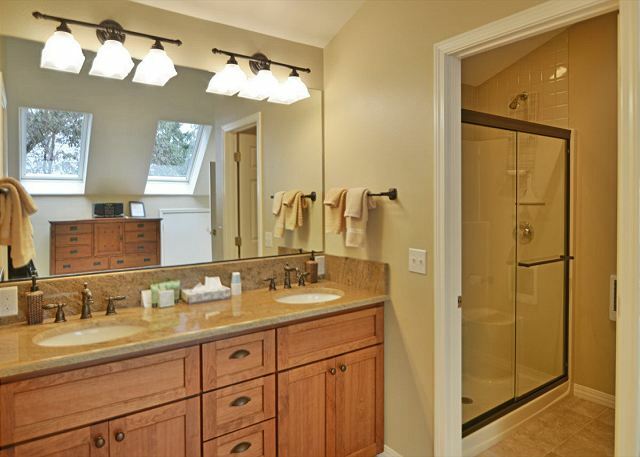 *Bathroom upgrades that include new stone counters, flooring, & fixtures. *A super new deck across the entire front of the home. *New living room furniture and TV. When you add these updated features to this classic Northwest contemporary, it is pure vacation enjoyment! You can dine in the afterglow of the setting sun, count the stars during a night time dip in the hot tub, doze in the hammock by the beach, or embark on a cruise around the islands from your own marine backyard. (As a buoy and 40 foot shared dock are available for guest use, you might avoid the ferry lines and arrive in your own boat!) 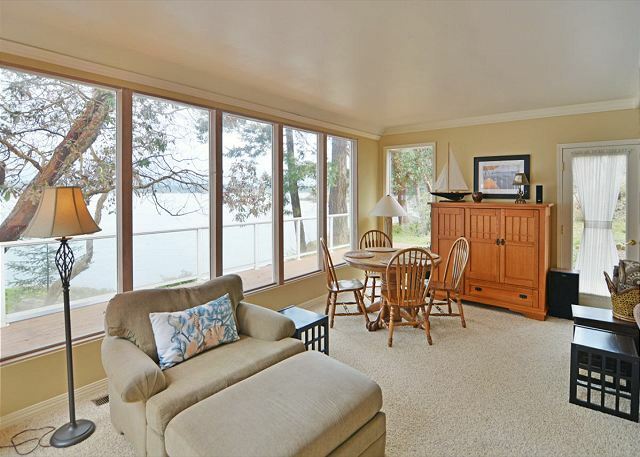 Solarium windows stretch across the entire front of the home so, whether indoors or out, you're surrounded by a panorama of neighboring islands, blue waters, big skies, and the activity of ferries and recreational boats as they arrive and depart from Friday Harbor. The comfortable character of Carter Beach will be appreciated by couples and families alike. The home offers a spacious master bedroom on the upper level with king size bed and private bath with shower. There are two other bedrooms that share a full bath just down the hall, one with a queen bed, and the other with both a queen and twin. The requisite entertainment and electronic connections, including WiFi and satellite TV, are also provided. Carter Beach is located in a desirable, upscale, neighborhood within a few miles of the ferry landing and the shopping and entertainment venues in the town of Friday Harbor. This is a fantastic vacation home in a fantastic vacation location. But you'll have to book early if you want to enjoy this special home because many guests return to Carter Beach year after year. The house was great and the kitchen very well stocked with all the necessary tools to make awesome meals with the local fresh seafood. Location and views were perfect. Wish we had a boat to tie up to the dock! The only issue we had was that none of the TVs worked the entire duration of the stay. Wintery Visit to the San Juans. Our visit to the Carter Beach house was all we had hoped for. We came wanting a break after a tough year. We also came to find out what it was like on SJI in the winter as we are considering moving here. The weather was uncharacteristic. Cold but bright sun all day. Every day. For a week. Hiked and ran and went to Orcas. Bought delicious fish off the pier fish store. Ate like royalty in the wonderfully equipped kitchen. The house has a great view and the kitchen is fully stocked. The deck has wonderful comfy chairs and heaters to hang out under when its chilly. The bedding could be a little more luxurious by adding feather pillows and duvets instead of the “bed in a bag” type comforters —- also needs some linen or cloth napkins for meals. But over this house is fabulous! Renting was easy. We were here for a week of biking on the islands. We arrived early and it wasn't a problem for them to let us in. The house was very clean and allowed a lot of room for our party of 8 to spread out. They had a very nicely stocked kitchen, extra towels for the hot tub. The hot tub was very clean and beautiful views of the ocean. We watched the ferries come and go from the deck.The only thing we noticed was the carpet under the dining room table was very stained, otherwise the house was very clean. We love Carter Beach 177. Full 180 degree view of the Sound, as ferries come in and out of Friday Harbor. Close enough to bike or walk to Friday Harbor and far enough away to feel a sense of tranquility amidst the vast waterways and islands that surrounded us. Great house, great trip will rent this house again! Loved the house and location. Unbelievable views. Walked to Friday Harbor several times Fun watching the ferries and boats from the house and spa. Did not get spa to work (above 95 degrees) until 4th day of our stay, when spa lady came. Kitchen was large and had everything we needed to cook (great knifes and new pots and pans). Overall a wonderful house and we will definitely return. This is the second time we have rented this home. It fits all our needs and more. Beautiful home, great location, close to town, deep water dock and every amenity imaginable. The neighbors are even great and brought fresh crab over to us one evening. Loved this location, floor plan and setting. Everything was as it should be. Grill was clean and worked. Hot tub was clean and worked. Home was clean and well-equipped. A lovely stay! Beautiful view. Seals, otters, bald eagles right there! Very comfortable, well-designed house. 10 minute kayak to Friday Harbor. The vacation was great, the view was stunning, the island was beautiful I wonderful relaxing vacation. Vie2ws of sea lions right from the house. Neighbors and everyone on the Island was very friendly. My family and I were so fortunate to rent this house over Easter weekend. It was a great spot to get away, relax and cook a great Easter dinner. The house was very clean and well equipped. The view is stunning, and we spent a lot of time skipping rocks, watching seals and birds, and enjoying the fire pit. However, there are a few things I suggest the owners consider improving -- the kitchen knives are basically useless and even after sharpening were not any better, the TV remote is barely functioning and could use an update, and the mattress in the middle bedroom was so bad that my back ached for days following our stay. Relaxing and clean. Had everything well stocked and the lay out was great! This house was perfect for our family. The location - right on the water - was fabulous. The dock was used frequently by our grown sons who love to fish. The view of the ferries and other boats going in and out of Friday Harbor was wonderful to watch. The house was in immaculate condition and had ample supplies in the kitchen and bathrooms. We had a glorious family vacation! The view is fantastic and the house is great! Used the dock and buoy. Rented a boat from San Juan boat rentals and cruised the islands meeting up with family staying on a boat. The hot tub and fire pit table on deck were the favorites. Grilled a few nights, the grill worked well. Our propane tanks were empty on arrival so be sure to check those right away for maximum enjoyment.They brought replacements right away. Loved the layout of the house and bedrooms. Windows show off the view. Kitchen and baths nicely remodeled. House mostly in good condition. Had a few minor repairs needed but hopefully they will get to those. The small office was great for storing things out of the way and setting up a laptop. AC not the best but they did provide fans. Screened windows were a bonus since the back of property is woodsy. Management was very helpful with all our needs and questions. Overall a wonderful place to stay. Even better than the pictures! Hope to come back again. We had a great visit. The place was in very good order and we plan on returning. Ceiling fans in bedrooms would be a nice addition or at least a couple more standing oscillating fans would do. From the ease of reserving and checking in to the beauty of this great house--this was a superb experience for our entire family. The pictures of this home and its surroundings do not begin to do it justice. Simply the best vacation we have ever had. I rented this house for a girls family vacation with family coming from several states for our annual trip. I live in WA but had never been to the San Juan's so it was a new experience for all of us. This house could not have been more perfect. Incredible views, private beach with a family of seals that live just off the shore, really nice decks and Jacuzzi, and most of all the house itself. So much natural light and privacy. perfect rooms for the family members I had coming and really nice bathrooms and kitchen. We were able to cook and sit down at the large dining table and enjoy each other and the view. I have several friends who already want info on this house for their getaways. Close to town and convenient in every way. LOVE IT!! Spent three night here on a boy trip weekend to kayak, hike and whale watch. Wonderful location and nicely maintained home with 3 bedrooms and 3 baths (2 bedrooms share a bathroom but there is a full bath downstairs as well). Home is on the water looking at Shaw Island so you can see the arriving ferries. Seals and dolphins were frequent visitors especially in the early morning. Wonderful outside 2-level deck area with hot tub and gas firepit. Home layout is excellent with skylights and glass patio and balcony panels to really let the outdoors come in to the home. Excellent kitchen area with amenities and skylights in master bedroom. 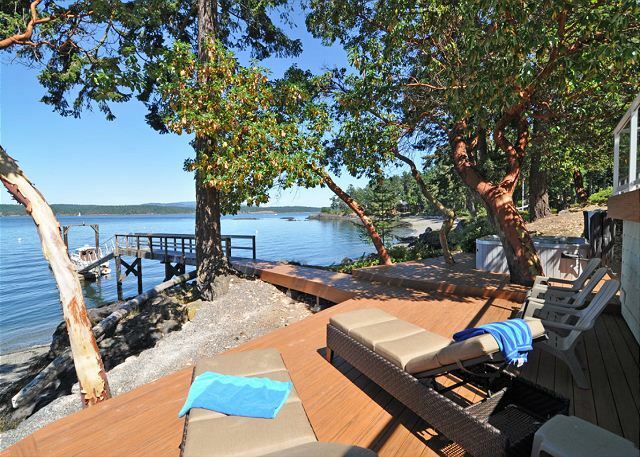 Just a outside of Friday Harbor with nice privacy and plenty of space. This house was spotless and all check-in was well communicated with no issues at all. Would definitely rent again with friends. I wish they allowed dogs as I would bring family here from Seattle and my Labrador would love it! Both of my friends from out of state loved the place as well and want to come back with their families. You get what you paid for and I was very satisfied. We had a great vacation. We found the home to be in good order and enjoyed our experience. We had an excellent experience. Property was everything we expected and more. We rented this house for a long awaited family reunion with my two daughters. It was more than we hoped for. It was simply put, outstanding. The house was fantastic in every way. Large windows to take in the view of the channel and all of the ferry and boat traffic. The deck and deck furniture was very comfortable and seemed new. The outside firepit and grill was an added bonus which we used on brisk mornings. The house was amply stocked in the kitchen and baths with everything one could want. Just from this house we saw deer, otters coming up on the deck and dock, eagles, kingfishers, crabs and jellyfish in the water. A short walk down the road and we saw red foxes. The house is only a short drive to Friday Harbor to partake of the fine eateries and shops. Frankly, we have rented homes before, and sometimes quite disappointed, but this house was the best yet. We are already looking forward to our next visit, and it will include this house. 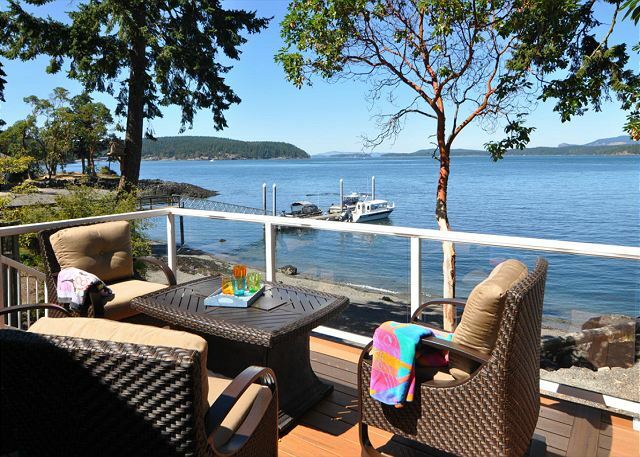 You can't go wrong by staying in this home during your visit to San Juan Island. This was our first trip to Friday Harbor. My wife and I came with our daughter, her husband, and their two children. The home is located in a beautiful area, but also close to town for restaurants. etc. The views from the house and deck are beautiful. We used the hot tub daily. It was warm and ready for us on arrival. We saw seals, otters, and a bald eagle landed on our tree. It was fun watching the ferries go by on a regular basis. It was a perfect vacation and we hope to return. We rented Carter Beach as a getaway for our family after a long, very busy year. My husband said he could feel his bloodpressure drop the minute we walked in the house. Beautiful setting, perfect spot for us. Friends and we -- three couples -- spent a week at the Carter Beach House and had a fabulous time. The weather cooperated which in this neck of woods is a big plus. But the house was a major part of the experience. Because it is located on the north shore, we were not initially that excited (we started looking late), but the location was wonderful -- very close to town but feeling quite distant and somewhat isolated. Sunsets (July), easy access to the water and storage for kayaks. The house is very well-equipped with a new kitchen. All rooms on the first floor have views. 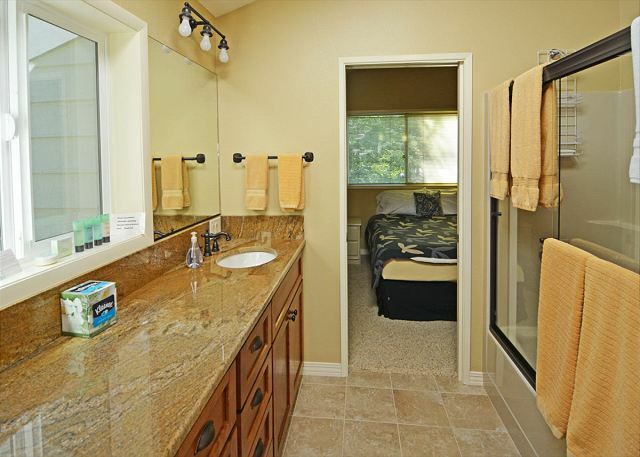 The master bedroom is quite spacious while the other two bedrooms, which share a bath, are quite adequate. After spending a week there and exploring the entire island, more than one person suggested we come back to the same house. This is an amazing vacation rental! It is just a few minutes drive outside of Friday Harbor, close to everything but just far enough away to be peaceful and quiet. The house is beautiful, with everything you might need for a relaxing stay. The walkout beach was a great place for our young boys to explore. The house was spotless. We received a phone call from the owner of the home on our last night to make sure we were pleased with our stay. We would highly recommend this property! This was our second visit. Wonderful place. We had a perfect week. This place has more windows than you can ever look out of! It was the most wonderful view for a morning coffee, breakfast or crab feast at night! The outdoor fire/table was perfect for relaxation! A great kitchen to prepare wonderful meals and very easy to get to from the ferry. Great for kids young and old!! We have never been to the San Juan's and what a surprise! It was beautiful! We loved the home, location, dock (we brought our own boat), hot tube, and beautiful kitchen. One our favorite family vacations. Thanks! We would recommend this house to our friends. The location and dock access was excellent. We loved the hot tub! Very comfortable and had everything we needed. Also liked all the neighbors, Enjoyed getting to know them as well. Our vacation rental exceeded our expectations in every regard. The stars assigned show our levels of satisfaction but what they don't show is how amazing it is to stay here. The location is perfect, we were on, or in the water everyday, it's right there. We watched seals and bald eagles and river otters and a humpback whale swam past the end of the dock. We cycled to town, we ran to town, we took the ferry and cycled on Lopez island, we hiked English and American Camp. We ate on the deck every day, we sat in the hot tub and admired the view and counted the ferries in and out of the harbor, we watched the seaplanes arriving and taking off( our son is a pilot for Kenmore Air)....we could not have had a better vacation and this house had everything, including very friendly neighbors. We can thoroughly recommend a stay here...the longer...the better. Although the longer you stay the harder it is to leave. We have rented this property for many years now. It was particularly in better shape this year than in the recent past. It would be much improved to have the seven night week start on a Sunday or a Friday so that short term guests could include a whole weekend in a stay. We missed the large rocker lounge chair and think that the old piano was a feature. It is always inspiring to watch the sunset from the deck or the dining table. The location was good but missed the great west side sunsets. Also, the beach was not walkable most of the time due to tides. Dock was great and overall had a wonderful time. Kitchen was excellent and loved having 3 showers there. this property for 10 years, and it is a house certain to create fabulous memories! The deck has a number of deck screws and nails coming up. There several boards that are starting to curl, causing a tripping hazard. The entire deck was replaced and expanded in the spring of 2012 - it's now a truly wonderful place to hang out! We enjoyed our stay on San Juan Island. The house was well equipped with a wonderful view. We hope to visit San Juan Island again in the futre, The only complaint was that the satellite TV was not working when we arrived and was not repaired during our stay. Trees on a neighboring property apparently grew taller over the winter and are obscuring the satellite signal. Unfortunately, the technical resources on the Island are limited and the service company could not schedule someone to reposition the Dish during your stay. The issue is now resolved, but we truly regret that you were inconvenienced by this loss of amenity. Please come visit again so we can make it up to you! My 2 kids and I stayed there. I was afraid it would be overkill just for the 3 of us but it was not. It was very cozy and gorgeous. We saw Habor Seals, Bald Eagles and deer without even leaving the house. The house is about a mile from town (not really a good walk though because of the winding roads). It sits back off the road and is very secluded. It was truly relaxing and beautiful. There are 2 couches one of which is pretty broke down (I beleive it is a pullout as well). The iron is falling apart and for the first time I used it it spit out rust. I do not believe that they should leave it up to the renter to do dishes and laundry. The spoons still had coffee on them, and I had to wash some other items prior to using them. As for the laundry, at the nightly rate that is paid I would think that the sheets etc could be (and should be) sent out to be cleaned professionally. I did my part and washed several loads prior to us leaving but I would hesitate to say every renter does the same.The only thing that this property was missing was a firepit outside and a bbq. There is what looks to be an outdoor fireplace but it was overgrown with weeds etc. The hammock area also had weeds and grass over 2 feet tall surrounding it so we could not use it either. OVERALL this place is like a dream! We will definitely be back! It was an amazing vacation. Hi Billie, Thanks for the kind words about the home and we are so happy that you enjoyed your stay! To address the issues you raised, we do not expect the renters to do laundry or dishes - possibly the prior renter put things away so our housekeeper didn't realize they were dirty? We regret that the grounds were not detailed and that the hammock and BBQ were not set up - we experienced the coldest and rainiest spring in 60 years and could not do exterior work as is typical. We do appreciate your comments and will bring the items you suggest need replacement to the owner's attention. Look forward to seeing you next time! The property location and view were wonderful. Its in need of some repairs, light above main table did not work, no stereo that works, shower doors falling off.Stained carpeting, etc. Good bones, needs a little attention. Perfect Home for Boat Owners! WE have returned to this house for eight years. We bring our 17 foot boat and tie it up at the dock, going out on it to explore the islands almost daily. River otters, eagles, seals, and kingfishers come to visit, and we spend a couple of hours on the deck every night watching the sun set. This is a fabulous spot! How can you look at anything else but the beautiful view? Very peaceful watching the ferries - and the whales breached right outside! It was an absolutely lovely vacation. And the rental house is the greatest! The views and atmosphere of the house is just more than anyone could ask for. I've rented many vacation houses and this one was one of the nicest, most well set-up houses I've ever rented. It had everything in the kitchen we wanted to cook gourmet meals. The decor in the home is beautiful, yet not too fancy. The view is gorgeous! Even though it was rainy while we were here, we didn't mind because the view from the kitchen/dining area is amazing. I highly recommend this home!! !